Kristjan Port (vasakul) ja Neinar Seli pärast komisjoni töö esmaste uuringutulemuste avaldamist pressikonverentsil juuni alguses. At long last, the report by a committee investigating activities of former Tartu sports physician Vitali Bernatski, allegedly a mediator of doping substances, came public yesterday. As expected, no-one’s guilt or innocence is directly proven therein. For the next steps, the ball was now thrown to Estonian Olympic Committee. 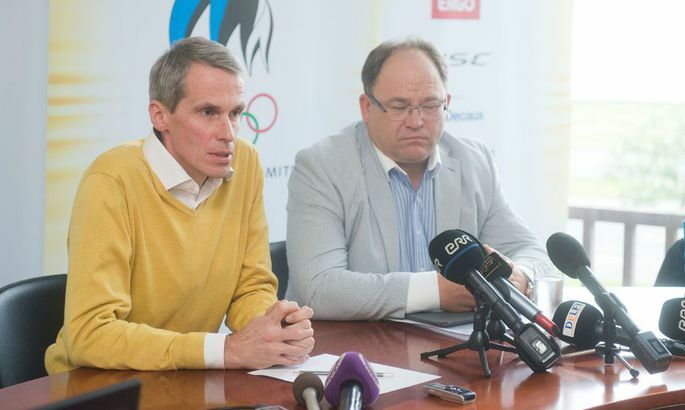 Namely, the report concludes that EOC ought to use its powers to find out why several people mentioned by Mr Bernatski were unwilling to cooperate with the committee, and to weigh their suitability as persons with responsible positions in sports life. According to EOC president Neinar Seli further possible steps need to be discussed at EOC executive committee. «We have received the committee’s report rather recently. This needs to be peacefully read and digested for a while,» he said. «We will surely be also drawing some conclusions.» Even so, Mr Seli was of the opinion there would not be a major witch hunt because the people mentioned in the report are now stained anyhow. Mr Seli is right – there are people in Estonian sports who indeed do know more about the Mr Bernatski story or doping-use as such – much more deeply than written in the report. The committee’s report says no sportsman or coach mentioned by Mr Bernatski did admit being connected to growth hormone purchases from said doctor. Even so, the report does underline the activities of several people still in vital roles in Estonian sports. Based on the invoices presented by Mr Bernatski, Estonia’s most recognised ski-coach Mati Alaver was his client from September 2002 to January 2004. The latest meeting with Mr Alaver related to forbidden substances is said to have happened in August 2006. The report also refers to the doping-story of Mr Alaver’s disciple Andrus Veerpalu which, as we remember, was also linked to growth hormone. Mr Alaver declined to meet the committee, only sending an e-mail stating that it was not in his power to refute the publicly spread information damaging to skiing and the reputation of Estonian sports as such. He added that if he had any information or evidence making it possible to refute the false claims, he would surely have shared these with the committee. Publicly, Mr Alaver has claimed that after Mr Bernatski left the Estonian national ski team, in 1990, he has had no contacts with him. Harry Lemberg, one of the most fruitful running coaches in Estonia, is said by Mr Bernatski to have purchased growth hormone and EPO. And while Mr Lemberg said at the beginning of the story that he did not know Mr Bernatski, he later confessed to the committee he knows the man well – while denying purchases of the banned substances. When the committee proposed a confrontation where the contradicting claims of both parties could have been heard, Mr Lemberg declined. According to Mr Bernatski, Aleksander Tammert – Olympic bronze in discus throwing and now head of sports society Kalev – on two occasions bought growth hormone from him. Mr Tammert, however, claimed not to know anybody named Bernatski and, like Mr Lemberg, refused to be set face-to-face with him. Others to refuse to be questioned by the committee were former javelin throwers Margus Kübar and Donald-Aik Sild; contacting the former long-jumper Priit Soosaar proved fruitless. The former ski champion Raul Olle did testify, but denied purchasing banned substances and was unwilling to meet Mr Bernatski in the presence of the committee. Thus: not a single confession, but lots of examples on behaviour of the accused. If any, and who, is guilty – let the reader judge.